This morning I noticed a bit of conversation over Twitter regarding this petition that has appeared online. The petition seeks to encourage the World Series of Poker to eliminate all rake from the Main Event as well as to start a “revenue-sharing program to supplement the prize pools” with money generated from ESPN and other sources. It’s a pipe dream, no doubt, although the petition did cause some to recall how, in fact, the WSOP Main Event was not raked as recently as 2002 (when it was still under the Binion’s Horseshoe aegis). That historical tidbit reminded me of a conversation I’d had several years ago with Nolan Dalla who for many years served as the Media Director for the WSOP. 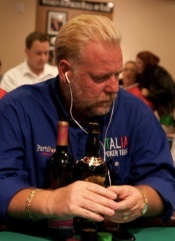 (I believe his current title is “WSOP.com Senior Writer.”) Actually the conversation was an interview I did of Dalla during the 2010 WSOP for Betfair Poker. We started that interview talking about the WSOP circa 2002, in fact, just before the “boom” happened and Harrah’s acquired the WSOP. After a little hunting around I found that like other older articles I’d done for Betfair the interview with Dalla also is no longer available online. It took some more hunting, but I eventually found the sucker, and as I’ve done before here with some of those items that have disappeared I thought today I’d share the Dalla interview here. I like this one a lot, not just because of the nostalgia it evokes thinking back to 2010 and the various WSOP-related topics of interest back then. I think my favorite stuff comes at the end where we get into the topic of tournament reporting and the relative place of writing about poker. The WSOP Main Event is now underway, and I remain at the Rio both this week and next to help cover the Series for PokerNews. I had the opportunity this week to sit down with Dalla to ask him a few questions about his involvement with the WSOP over the years and about how this year’s Series has gone. Short-Stacked Shamus: You’ve been WSOP Media Director since 2002. Let me start by asking -- how did you end up in this role? Nolan Dalla: Well, quite by accident, really. I was in the middle of a perfect storm, so to speak. Back in 2002, we really didn’t have many media here coming to the World Series. There were a few poker writers, and 300 or 400 people played in the Main Event -- nothing like the scale of today. Then everything pretty much changed my second year with the World Series working for Binion’s Horseshoe. I had moved to Las Vegas and was the Director of Public Relations for the Horseshoe. A lot of people don’t remember that right before Chris Moneymaker won the WSOP Main Event in 2003, the Horseshoe and the World Series were on the rocks. The World Poker Tour had just started and their numbers were enormous over at the Bellagio -- they were actually beating us. And here I was working at the Horseshoe and it felt like we were rearranging the deck chairs of the Titanic and the ship’s getting ready to go down. That really was the prevailing attitude. SSS: Wasn’t the World Poker Tour talking about buying up the World Series? ND: They actually made a cash offer. I remember I was in the office when a fax came in. I can’t say what the figure was, but I remember that figure was looked at and considered, and boy, it was a bargain basement price at the time, considering what [the WSOP is] worth now. Nobody could really have foreseen how everybody’s life would change in May 2003 when Moneymaker won. When I talk about a perfect storm, it was ESPN’s first year [doing a multi-part series on the WSOP], Chris Moneymaker, the everyman, wins the Main Event, and I just happen to be the Media Director. I think I knew it was going to be a big moment, but I don’t think I realized how big a moment until I looked at my cell phone [after Moneymaker won] and I saw the David Letterman show, CBS, the New York Times, the Washington Post, ESPN... it was like whoa! And everyone’s life, including my own, changed from that point forward. SSS: So here we are in 2010 and the Main Event is underway. From your perspective, how has the 2010 World Series of Poker gone thus far? SSS: A lot of us were curious about how the World Series would go after the departure of Jeffrey Pollack as Commissioner, who I think a lot of people felt like contributed quite a bit during his tenure. Is there anything that has been different without a Commissioner? ND: It’s a fair question. I think that most of us who worked with Jeffrey look at that period very fondly. He did enormous things for the World Series from 2006-2009, and certainly he’s left an indelible imprint upon the World Series. However, I will say that the new management team -- starting with Ty Stewart, Seth Palansky, Howard Greenbaum, and others -- have been around this game for many years and they have learned, as we all have, from some of the mistakes we’ve made years ago and we seemed to have gotten it a little bit better every year until we’ve reached this point. I think anyone who has come to the World Series this year has to say that the facility, the comfort level, the organization, everything about it is much better. Is it perfect? No. Can it get better? Yes. But I think that as far as the World Series of Poker experience goes, I don’t think it’s ever been higher in terms of satisfaction. SSS: I had a chance this year to help cover the Ladies Event, where there was some controversy when a few men entered. So I was there when you came and said a few words before the final table in support of the Ladies Event. Comment a bit on what you said there. ND: We need more women in poker. No one can disagree with that. That is a good thing. And women’s poker tournaments and the Ladies World Championship fosters that greater participation. No one can disagree with that. That’s a fact. I think for anybody to upset what I call a fragile balance that exists, I think that’s a bad thing and is counterproductive to the game -- not just to the women in poker, but to the game. I understand other people have their own agendas and they may have their political views with regard to equal rights issues and all of these things -- that’s all fine. But the bottom line is what is good for poker? What is good for the World Series of Poker? And that is to protect the integrity and tradition of that event. The Ladies event started in 1977 -- that is 33 years! Unfortunately we have to let this issue play out, maybe in the courts or wherever this fight and this discussion is going to take place next. But I think there are a lot of us who really want this tournament to continue and are going to do everything we can to make sure it continues. SSS: Not to make you draw attention to a particular embarrassment from this summer, but is there anything that’s happened here in 2010 that maybe would wind up on an a list like the one you compiled for that article? ND: As you know in this job there are a lot of hours you put in and if you see a lot of things it is kind of like the law of large numbers -- you make more errors. And I’ve sure made my fair share over the years. And sure, I’ve had a few more this year and I think that I’ll do a follow-up column and it won’t be the ten most embarrassing moments but maybe the 20 most! SSS: I can identify with this very strongly. You put in a 14-hour day and you do your best to be perfect and cover everything, but it can be a challenge. ND: Yes, and it’s a shame also that you just don’t have the mental capacity to talk to everybody you want to, to get to know everybody you want to. Because, really -- and I really believe this -- there are 65,000 people who have played in events this World Series so far, and there are 65,000 stories out there, if you go after them. Everybody has something to say. The problem is there are only 24 hours in the day. SSS: Even if you knew, I don’t think you could answer this next question. But where do you think the World Series of Poker is going to be next year? ND: Yes, everyone is speculating [about whether the WSOP will relocate from its current home at the Rio All-Suite Hotel & Casino]. That is the big question everyone will probably be asking once this Main Event ends. It’s appropriate because people care where they are going to be playing. And I can tell you that anybody who thinks they know the answer to that question doesn’t know what they are talking about. The Harrah’s organization will examine all of the options, and those discussions really haven’t started that much yet. So anybody who thinks they have inside information, they really don’t. SSS: What I keep hearing is “A dealer told me that it was going to be...” and generally the sentence is finished with wherever it is that dealer is dealing. ND: Haha, yes. Any property in Las Vegas would love to have the World Series, with all the people eating in the restaurants, staying in the hotel, gaming, and the excitement and publicity that it generates. The World Series of Poker is really Las Vegas’ best infomercial. Forget about that “What happens in Vegas, stays in Vegas” campaign, the best informercial for Las Vegas is the WSOP. And so any casino would love to have this event at their place, and it is just a matter of seeing where it will end up. SSS: Okay, last question. You’re the WSOP Media Director, so you spend a lot of time helping those of us who report on the WSOP and try to give us what we need and make it so that the covering of the World Series is as successful as it can be. What is your impression about how the WSOP is covered currently and do you have any ideas about how it could be done differently? ND: Boy, that’s a great question. I don’t think I’ve ever been asked that. I had a very interesting conversation with a reporter from USA Today -- we were talking last night at dinner, in fact. And he said that he thought poker was tailor-made for the internet. And he’s right -- the immediacy of the internet, and people turning on a computer in 115 different nations and say -- bam -- Phil Hellmuth just busted out two seconds ago, that’s incredible. So I agree that this is a game that is tailor-made for the internet, and I expect that to be the major focus [of WSOP coverage] as we move into the next few years. SSS: When you say that it makes me think that there is something about poker -- that ESPN can do what they do, and we can put cameras on people playing and watch it happen -- but there’s something about poker that almost requires it be narrated, that is, put into words. And the immediacy of the internet helps us tell those stories almost as they are happening. ND: You just nailed it there. If you watch something, sure it is interesting. But having someone there creating a mental picture of what happened... it’s kind of like how they say the book is always better than the movie. I’ll tell you something, I’m astonished the talent that has come into this game as far as writing goes, especially in the last three years. There are some really fine writers, and people who come from all walks of life, who have come into this game. We didn’t really have that five years ago. Not that poker writers were bad, but we’ve got some extraordinary talent and people who love and are passionate about the game and that really comes through in the coverage now. I mean on many sites, not just the news sites, but the bloggers, reporters, everybody. Much thanks to Nolan Dalla for taking the time. And speaking of good poker writing, if you are looking for a excellent read about one of poker and the WSOP’s most fascinating figures, let me recommend to you One of a Kind: The Rise and Fall of Stuey ‘The Kid’ Ungar by Dalla and Peter Alson. Thanks for linking the WSOP petition. Pipe dream... probably so. But quoting ancient Chinese philosopher Lao Tzu, "the journey of a thousand miles begins with a single step." If WSOP still is the best infomercial for Las Vegas, as Nolan Dalla said in 2010, the players should not be paying for 100% of the operations and prize pool, leaving 100% profit off TV rights, sponsorships and other ancillary revenue sources. Nolan Dalla does a great job, however, and his bio of Stu Ungar truly is one of a kind. Great interview. A great interview starts with great questions, so thank you. Nolan is a special person. I'm a nobody, but made it to Day 3 of an event. Having a name like David Smith, however, is not without problems. All the media stuff had me listed as from California. I approached Nolan, and even though he was busy, he stopped what he was doing and helped straighten out the problem. I know it's his job, but the way he did it was gracious to say the least.